The pre-show music for Six has a period feel to it, though this proves to be deceptive. I mean, this is the story of the wives of King Henry VIII (1491-1547), but the book, music and lyrics are all highly contemporary. “Remember us from your GCSEs?” the audience is asked, providing a not-so-subtle hint that the show is aimed at, well, people young enough to have GCSEs as opposed to O-levels (though I couldn’t help chuckle – given that this leg of the Six tour is at the Edinburgh Fringe, the locals here won’t have GCSEs but Standard Grades). I do not listen to the styles of most of the music in this production, but it is all performed with excellence and vitality. They all meet (it can be reasonably assumed) in the afterlife. Catherine of Aragon (1485-1536) (Jarnelia Richard-Noel), Anne Boleyn (c. 1501-1536) (Millie O’Connell), Jane Seymour (c. 1508-1537) (Natalia Paris), Anne of Cleves (1515-1557) (Alexia McIntosh), Catherine Howard (c. 1523-1542) (Aimie Atkinson), Catherine Parr (1512-1548) (Maiya Quansah) present their stories with as many references to the digital era as possible. For instance, in the opening scene, which is considerably long for a one-act production, the audience is invited to “find out about how we got unfriended”. It seems to be set up like a rock gig in an arena setting – the band was introduced both individually and collectively, as tends to happen in concerts, and the sound design (Paul Gatehouse) producing distinctly crystal clear but nonetheless atmospheric acoustics. Several times, the question is put to the audience whether we are having a good time. The audience reaction to many of the musical numbers was similar to a gig too (at the performance I attended, anyway), with justification – this is something both engaging and spectacular. It’s all the more incredible because the storyline has not, in effect, been altered: it’s not so much the plot itself that’s appealing but how it is delivered. The closing number was as high-octane as the opening one, ensuring the show went out on a high, which seems bizarre at face value, but the narrative had more or less run its course by this point in any event. In between lies much detail, spoken and sung in a gloriously absorbing fashion. “What hurts more than a broken heart?” asks Seymour. Boleyn is having none of it: “A severed head!” Perhaps predictably, each woman gets their opportunity to state their case and tell their story. Some are tales of defiance, while Anne of Cleves turns her story into one of satisfaction, having been given Richmond Palace as part of her divorce settlement. And it’s not all about party anthems and throbbing beats that wouldn’t be out of place in a nightclub – the more reflective numbers are emotive and tender. The choreography (Carrie-Anne Ingrouille) is vibrant and energetic, and the writing (Toby Marlow and Lucy Moss) is often accessible for audiences in the digital age – Henry doesn’t want to ‘bang’ Boleyn, but rather ‘hang’ her, and Cleves displeases His Majesty for not looking like her profile picture. I offer two criticisms. First, like Parr, I have reservations about the one-upmanship (or rather, one-upwomanship) that goes on in the show. Second, it’s over all too soon. But, as someone once pointed out to me at a performance of ‘Joseph and the Amazing Technicolor Dreamcoat’, putting on a good musical is a brilliant way of telling historical events. Both educational and entertaining, there’s no denying the power and passion in this bold, uplifting and magnificent production. 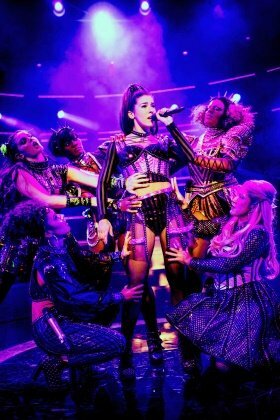 From Tudor queens to pop princesses, the SIX wives of Henry VIII finally take to the mic to tell their tales, remixing five hundred years of her-storical heartbreak into a 75-minute celebration of 21st-century sisterly sass-itude fuelled by an all-female band. These Queens may have green sleeves but their lipstick is revenge red. Following SIX sold out and highly acclaimed ‘showcase’ performances at the Arts Theatre in London, this homegrown histo-remixed pop-concert musical by Toby Marlow and Lucy Moss has its full professional premiere at the Underbelly at the 2018 Edinburgh Fringe Festival before transferring to the West End in August. A phenomenal future is predicted for the ultimate Queen Revival. SIX is sure to be the hottest thing on the block since Anne Boleyn’s neck! Think you know the rhyme, think again… Divorced. Beheaded. LIVE in concert!